I was looking at the stats for Card Boarded the other day and noticed something interesting. If you're familiar with Blogger stats, you know you can look at an overview of a blog's all time stats, which gives a summary of the most view posts, traffic sources, and total views. When I look specifically at the most view posts, in first place was this post about Jimmy Howard's DocOc mask from early this season with 4,815 views. In a distant second was this post about a 2010-11 Victory Rack pack from Walmart with just 327 views. This got me thinking about just how visible my blog is. When I type "jimmy howard" into Google, nothing having to do with my blog pops up right away as part of the 3,100,000 results. That's to be expected though, as there's news, videos, pictures, and all kinds of other Jimmy Howard information out there. The first mention of my blog isn't until the 51st page of results. When I type "jimmy howard mask" into Google, out of 196,000 results, Card Boarded shows up on the third page of search results. Not bad, but not really enough to get noticed, relatively invisible. When I type "jimmy howard new mask" into Google, out of 179,000 results, Card Boarded is the third link on the first results page. That's what I would call visible. When I type "jimmy howard collection" into Google, out of 6,030,000 results, Card Boarded takes the first, second, and third links. Add to that the eighth link to my Photobucket album for the collection. It's pretty neat to have the first result, let alone the next two. Keep in mind that these results are as of right now and will probably change over time, but it's still neat to take a look at where my blog stands in terms of visibility at the moment. So, if you want something along the lines of a blog like mine to be visible, it's all about where it falls as part of search results, whether it be Google, Yahoo, or any other search engine. Do any of you guys using blogger keep track of the stats? Do you notice anything odd within your stats? It's seems like it's been forever since I've busted any retail packs just for the sake of checking out base cards. Well, I decided to change that yesterday and picked up a single pack of 2010-11 Pinnacle from Target for $2.99 and a rack pack for $4.99. The single pack contained 10 cards and the rack pack had 40, so for just two extra dollars, I got 30 more cards in the rack pack, and when you're just looking for base and parallels (like I am with Jimmy Howard), I think the rack packs are the way to go. I was looking forward to getting some of this product, as I've seen a bunch of breaks already and really like the photography on the base cards. The inserts aren't the greatest, but that's not why I went for this, as I know there's little chance of real "hits" from retail packs. Overall, the photography in this set is awesome for the most part, a lot of unique shots with a few generic one's thrown in here and there. How often do you see a player holding a video game controller? Pretty cool if you ask me. I also love how the back of the card talks about where the photo was taken and the context of it, something I've never really seen on base cards before. It adds something unique to this set. Other than that, the design is pretty solid. 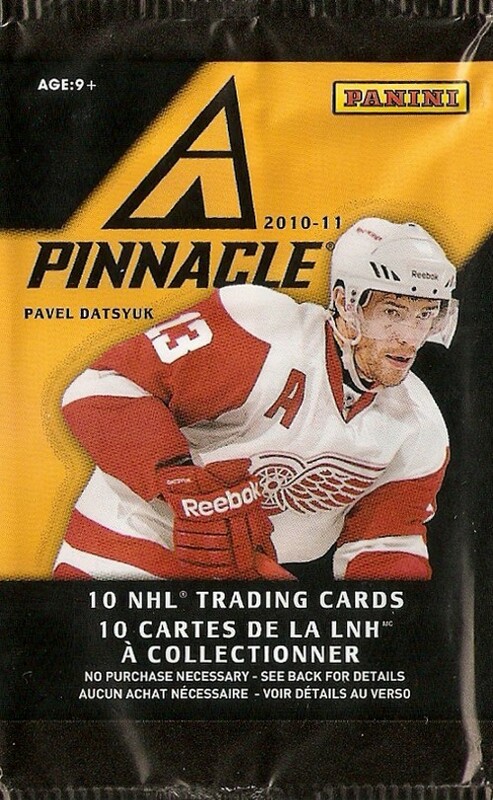 I've always liked the Pinnacle logo and it works well with the border design on these cards. The Ice Breakers are simply base cards with the logo added to the bottom right. 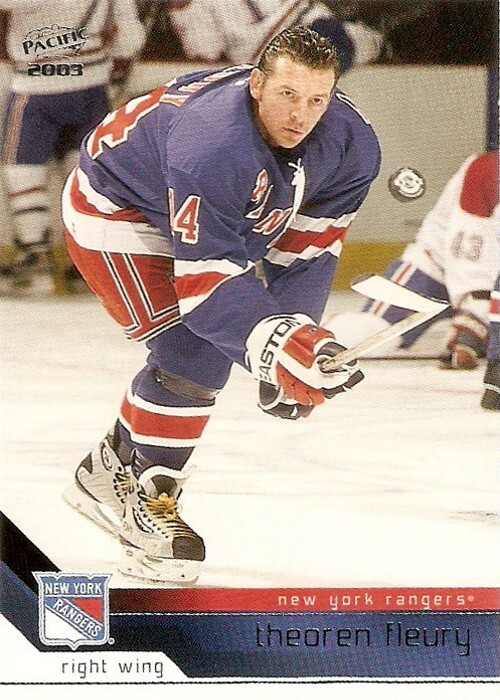 I think this is one of the rink collection parallels (somebody correct me if I'm wrong), and I really like the look of this thing when the light hits it. I don't know what to think about the Saving Face insert. It's a good idea for a set, but the execution isn't up to par. I wish they would have just brought back the Mask cards and been done with it. Oh well, maybe next year. So that's my foray into this year's Pinnacle release. I think I'm done busting any of it until prices come way down, as I'm just looking for the Howard singles at this point (drop me a line if you've got any available, I'd love to work out a trade). I was browsing the hockey card talk forum over at SCF the other day and came across a thread regarding ITG's redemption program for the misprinted 1/1 Emerald Masked Men III inserts. Redemption Program 1: Send in 17 Emerald Mask Men Cards for any individual player listed below and receive a Masked Men Game-Used Memorabilia card numbered to ten of the player you have redeemed. Redemption Program 2: Send in any 17 Emerald Mask Men Cards and receive a random Masked Men Game-Used Memorabilia card numbered to twenty from the players listed below. What I want to know, is how did ITG determine who was going to be a part of which list? I don't think it's right that 20 of the cards are numbered to 10, while the other 30 are numbered to 20. For me, as a Jimmy Howard collector, I'm glad he is part of the first group where you at least know what you're getting after somehow managing to acquire 17 of these things. I'd be angry if I was a player collector of someone in the second group, as you could go through the effort of getting 17 of them, and end up with someone else. 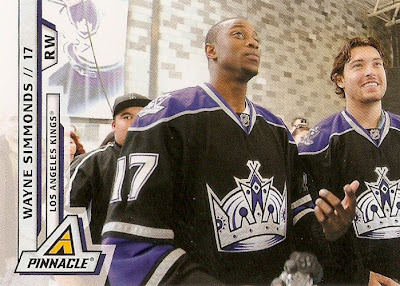 I thought about trying to get 17 Howard's, but at around $5 a piece, that would put me out of my current card budget, even if it would give me a nice memorabilia card limited to just ten copies. That said, I plan on keeping my "1/1" as a reminded of this screw up from ITG. Also, assuming all ten of the Howard cards are redeemed and 170 of the 340 Emerald versions are returned to ITG, that makes the one I have twice as hard to come by, which is kind of neat if you ask me. So, what do you guys think about this redemption program? Here's another pick I've chosen just because of the picture on the front of the card. It's a Theoren Fleury from the 2002-03 Pacific base set, which features a kind of unique action shot. One of the first things I notice about this one is the fact that Fleury is helmet-less, followed by the fact that he is batting the puck straight up in the air, obviously during warm-ups. I like this one because you don't see a ton of cards that feature warm-up shots, especially ones where the player is working on hand-eye coordination like this one. The ones you do see usually feature players stretching, which is unique in itself, but not as cool as this. Even though I chose this for the photo alone, I still really like the design of this set. 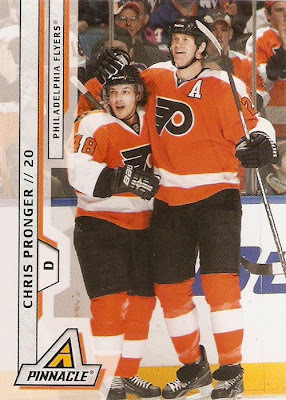 Kind of makes me miss all of the old Pacific sets as they were usually pretty sharp like this. They always have a simple design that's easy on the eyes, something I wish there was more of in base card design nowadays. As the title of this posts suggests, my latest Howard pickup came from CheckOutMyCards.com, a great site for buying single cards, as long as you're getting several at a time. I only got five different cards this time, but they're a decent mix, and I got all of them delivered for around $12. The first was this one from the 2005-06 UD Rookie Class set. I like this one because it's one of the few from his rookie year to not feature his Maine mask. 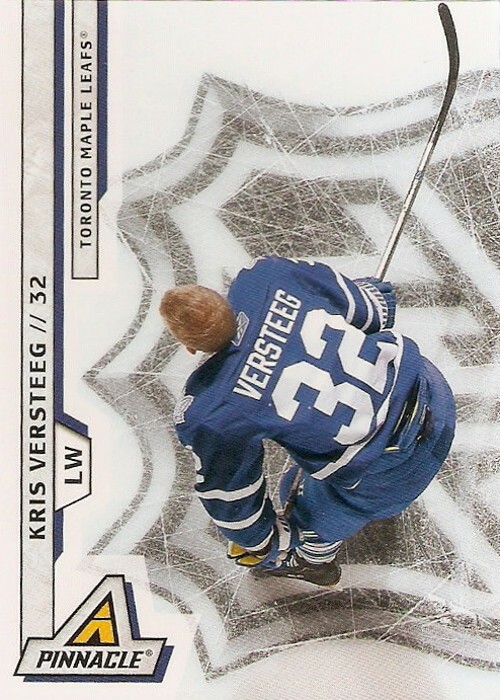 The second was this one from this year's Upper Deck set. Love the photo on this one, not a shot you see on cards very often, especially with the entire starting lineup in the background. 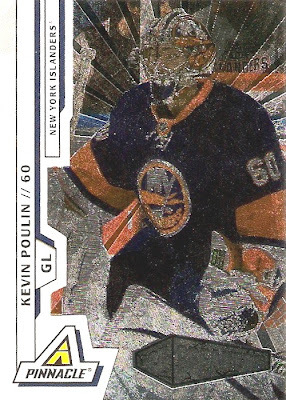 The third was yet another one of the many pesky parallels from this year's Certified set from Panini. 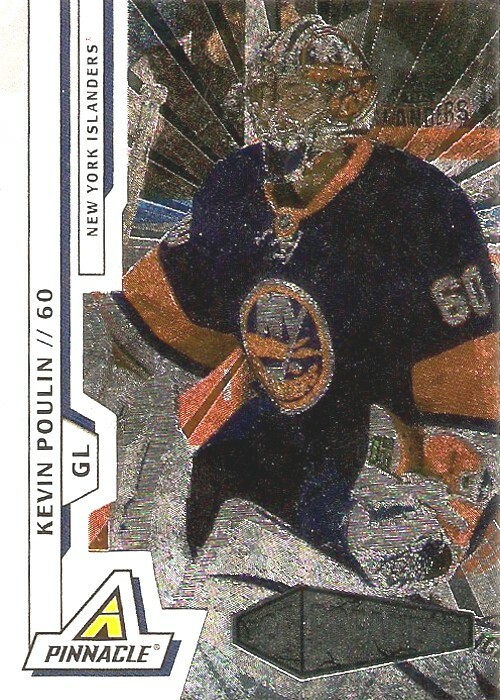 It's hard to tell from the scan, but this is actually a Platinum Red parallel, numbered to 999. The fourth one, like the third, is another parallel from Certified. This time it's a Platinum Blue numbered to 250. The last was just another base card to add to the collection, a Limited numbered to 249. So, there's five new ones for my growing Jimmy Howard collection. I now have 28 unique cards and 30 total, not a bad start if you ask me. Now that I've been at this for a little while now, I'm really getting into the whole player collecting thing, as I find myself paying more attention to new Howard listings on ebay than anything for my MVP master set project. I think it's because a player collection provides some variety, where a set project is the same thing over and over. Seeing that I've got 28 different Howard cards now, my first goal for the collection will be getting that number up to 50. I don't really have a timeline set for this goal, so we'll see how long that takes. It shouldn't be too difficult, as Jimmy has a ton of new cards this year, especially with all of the ridiculous parallels that Panini sees the need to put out in all of their sets. 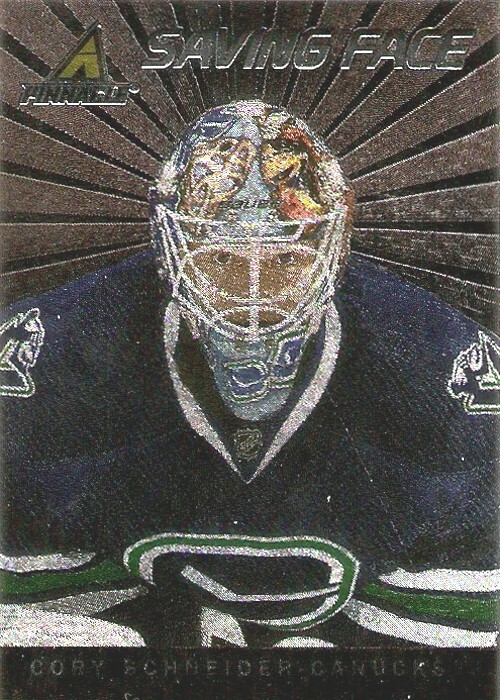 The emerald foil looks great on this card, just not when you scan it for some reason. In reality, it's a much brighter shade of emerald and looks even better when the light hits it. Even though the only difference between this and the gold foil base version is the color, I like the emerald a lot more for some reason. It just goes better with the background, giving it a nicer overall look. This gives me two parts of a pretty much impossible Artifacts rainbow. I've only see a few of the others pop up lately, but I've got plenty of time to go after them.